Though I'm only in my third year of doula-hood, with 8 births under my belt and countless hours of learning, I feel like I have a pretty firm grasp on what some of the main qualities are that it takes to be a doula. I believe that this career is not for everyone. Just like with every career, there are always going to be some people better suited for the job than others. If being a doula interests you, you're already on the right path! I would also love to chat with any of you who are wondering if being a birth keeper is the right path you! While there are many, many qualities that make up a good doula, here are 5 main traits that I personally think are most important. Birth can take a LONG time. And not just the actual birth. But the entire process of waiting for labour to even begin. Being on-call, the anticipation, having to leave at the drop of a hat. Once you do get called to attend the birth, it's waiting at the client's home, or the hospital, for however long it takes. Without getting bored, discouraged, impatient, or negative. You're damn right patience is a virtue! If you are already a patient person, I feel like you have a leg up as a doula. Respect for the birth process, respect everyone on the birth team, respect for the mother's wishes. Never undermining her opinions or choices. And never judging them either. It is the clients birth, and not the doulas. She must respect that always. As a doula, you. are. there. You don't book too many clients & risk missing one birth because you are stuck at another. You are on time for all meetings. You respond to phone-calls and emails as soon as possible. When you are at the birth, you are totally present, not playing on your phone or anything. Unless she needs space and alone time (in which case you hold the space & still keep an eye on things), you are always with your client, ready to squeeze hips, offer suggestions, answer a question, encourage. Your client relies on you for support; be there. This is not about me. I don't bring my problems with me to the birth, I check my ego at the door. Things that may take up space in my mind in day-to-day life are put on hold during my work. Every part of me is available at the birth. My body & my mind. The birthing space is sacred and it is my job to hold that space for my clients. This is about them. One of the most important parts about being a doula, is your passion. You must want to make a difference. You must want to help your client. 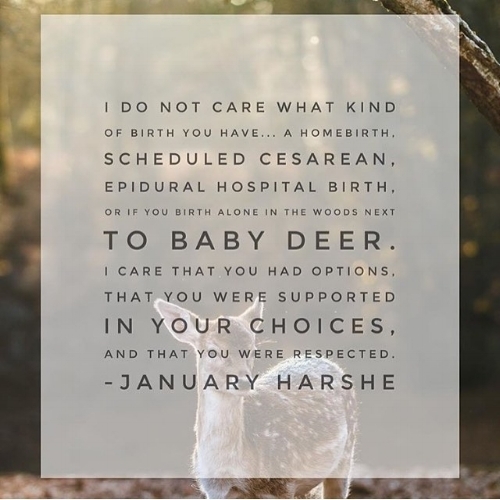 You care about birth. You care about your clients wishes and will help them fight to achieve their ideal birth. As a doula, I am passionate about learning about my clients & supporting their needs. This is important work, and passion is a must. Sometimes, a little bit of self-doubt creeps out and I worry that because I am fairly young & have not given birth myself yet, that clients won't hire me. While this may dissuade some people from deciding against hiring me, there are also plenty who don't care, or may even like the fact that I'm young! The same goes for older doulas as well. The right clients will be drawn to your personality. Age does not matter. If your doula had the total opposite birth as you want to have, that is okay. To each their own. If you are longing for a natural water birth, and your doula had a cesarean, what does that matter? For one, she may have not had a choice due to an emergency situation. But also, she may have chosen to have one. And that's totally cool! As long as she doesn't try to convince you to do anything you don't want to do, the way she gave birth truly does not matter. A good doula will support and encourage whatever type of birth you want to have.